Builders risk installation insurance is designed to cover one specific part of a commercial or residential new construction or remodeling project — such as roofing, concrete, plumbing, HVAC systems, solar panels or cabinets, etc. — and is available to subcontractors and service providers. What is the difference between installation coverage and builders risk coverage? 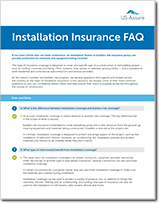 Can more than one installation job be insured under one policy? When is a remodeling policy more appropriate than an installation policy? Complete the form to download our free resource and get help securing installation insurance for your client’s next construction project.